2/4/07 Followed Julia's shaping steps and used 100% AP flour. 19-21 minutes wasn't long enough---crumb was a little too soft. Shoud change the recipe to 50-50 flour. 10/10/06 Made bread over the weekend. One flaw was that I only did a single envelope-fold for each loaf. The loaves came out a bit flat-looking, probably due to the lack of surface tension. Used 50-50 flour; texture, flavor and crust all came out excellent. 9/12/06 Made a batch for Helen's birthday that turned out excellent. I used 8 oz. bread flour & 8 oz. AP flour. Crust was a bit crunchy, crust was flavorful and chewey. 5/1/06 Did a three-rise batch over the weekend. Came out great. Very flavorful. Some nice holes. Crisp crust on bottom, a bit softer on top. 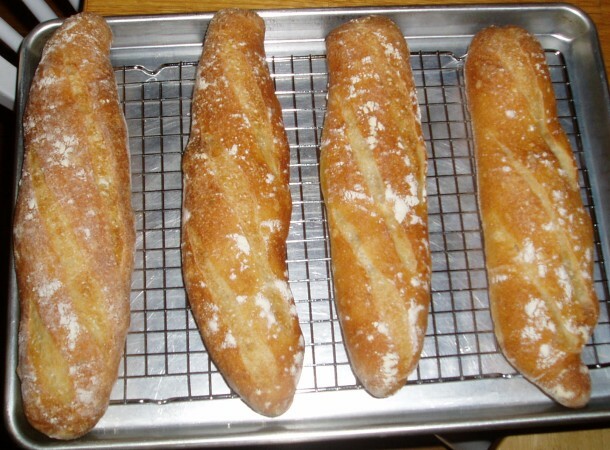 Even successfully slashed the baguettes. I took the breads out after 19 (outer) and 22 (inner) minutes. The middle was still slightly moist after 30 minutes cooling. I noted that the dough was very difficult to pull together at the beginning. Felt like there was too much water. Had to add a good bit of flour during kneading. But, I was very happy with the result. 3/13/06 Welp, I've now had a number of B&R breads, and there seems to be a consistent, clear deficiency: salt. 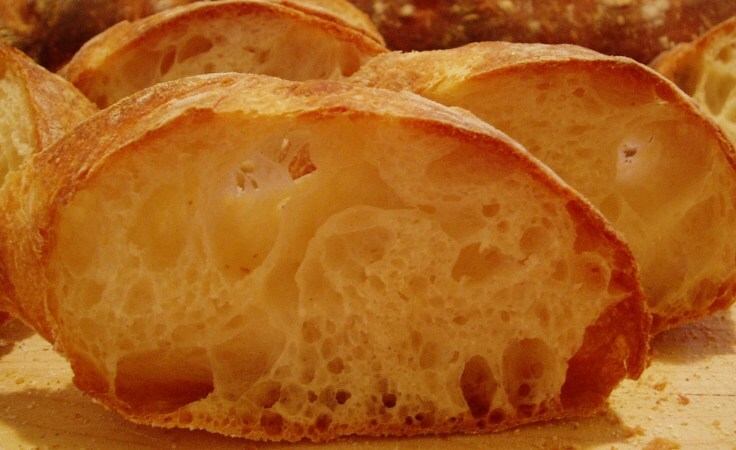 The crust and crumb are excellent, but the flavor leaves something to be desired. Though, low salt means that the breads serve as an excellent vehicle for other foods... None of them have had the flavor that you expect from great bread. Hopefully, Mike is experimenting with salt proportions b/c his crust and crumb texture are excellent. They will be delivering bread daily to Formaggio, so you don't have to live in Framingham to enjoy. The slated opening date is January 30, 2006. 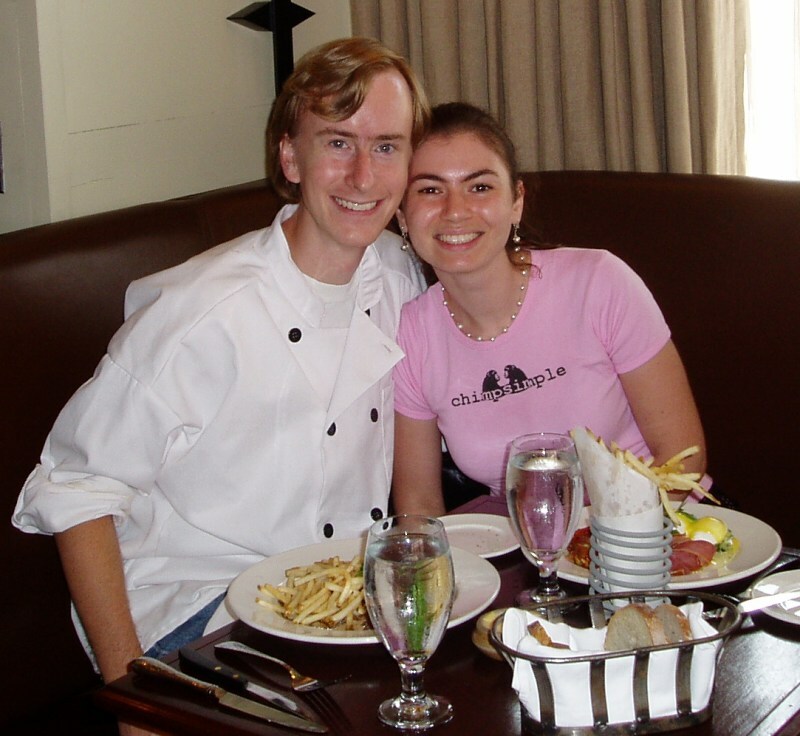 See my 8/28/04 post (below) for my experience baking at Sel de la Terre with Michael & Rachael. 1/8/06 I did two batches today, one all AP and one 1/2 AP, 1/2 Bread flour. I also experimented a bit with ice cubes. I tried putting 10 ice cubes in the bottom of the oven right before putting in the loaves. I didn't see a noticable difference vs. earlier tries. Though, I don't think there's any need to do what I have done in the past---add one cube every minute for the first three minutes. I think I can just put them all in at the beginning. I "botched" the all AP batched by leaving the oven at 500F. I noticed after 10 minutes of baking and turned it down to 450F and baked for 20.5/22 minutes. The mistake was actually a success---the loaves ended with a nice caramel-brown color, whereas the half/half batch was more of a dull, yellow-brown. The half/half batch took longer to bake, even considering the lower temp, 25/27 minutes. Fits with my hypothesis that bread flour takes longer to carmelize. The half/half batch received an extra-long second rise (close to 4 hours). 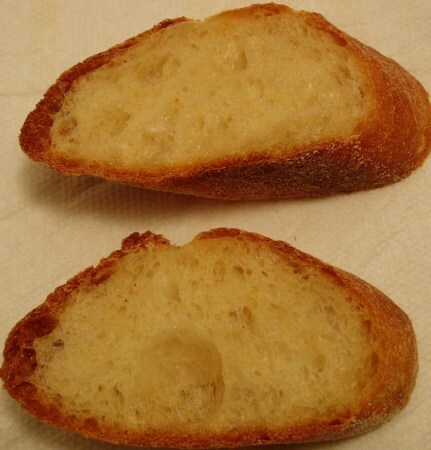 The left two pictures below are of the pure AP bread. The right picture is of the half/half bread. I think the pure AP bread came out a bit better, but that might have been due to the difference in baking temperatures. 1/3/05 I baked bread at my parents-in-law's house. Twice, in fact, so I even got a chance to refine the recipe a bit. First try, I used KA AP flour, a whole packet of active dry yeast, 2 t. of table salt and let the loaves proof on a cookie sheet (dusted with corn meal). I used fairly hot water (I'd guess 110F+) for the initial mixing. The dough rose very quickly for the first two rises, but didn't rise so well in the oven. Also, the bread lacked a bit of flavor. Otherwise, it came out very nicely and could be considered a success. For the second try, I upped the salt to 2 1/4 t., cut back on the yeast to 1 1/4 t. active dry, and lowered the temperature of the water (to ~95F). It still lacked a bit of flavor---I should try 2 1/2 t. next time. But, rising worked much better. It rose more gruadually during the early stages and produced a better crumb---no huge holes, but overall pretty air-y and light-feeling. I used lots of ice cubes---more than usual. Seemed to work well. I might try using more ice cubes in my regular recipe; also might be good to add the ice cubes a minute before throwing in the bread. 12/26/05 The results are in! And, the winner is... (drum roll) Julia! 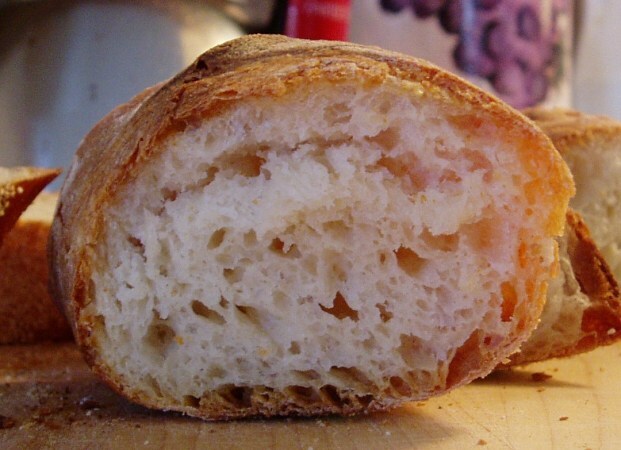 Julia's bread had a tender, crispy crust with an airy, chewy crumb and great flavor. I tried to convince myself that the overnight fermentation of Reinhart's recipe yielded better flavor, but I gave up in the end. Any improvement in flavor over Julia was greatly outweighted by the too thick and crispy crust of Reinhart, and the dry, thick crumb. Some of this could have been due to the slightly longer baking time I used for Reinhart, but there's no way Reinhart's recipe could have created the airy-ness that Julia's produced. One observation I made that I didn't expect is that the AP flour created more even holed throughout the bread. Some of my recent (bread flour bsased) loves had created very large, uneven crumb structure. I attribute the difference to gluten. Bread flour has high gluten content, which I presume allows for the creation of large bubbles. My guess is that AP flour can't do this due to lack of gluten, so the bubbles are more evenly distributed throughout the dough. Bread flour yields the more dramatic pictures, but I must say I much prefer the AP flour result for eating. It simply feels better in the mouth. Also, it's better for dips, spreads and for making French Toast (which Helen and I did this morning---absolutely fabulous!). 12/24/05 Today, I ran a bake off. Reinhart vs. Julia. New school vs. old school. Two masters facing off. Though, I should note that the recipes are heavily modified. The two recipes use identical ingredients. The difference is that (what I call) the Reinhart version uses a pre-ferment that sits in the fridge overnight. Julia's version does everything in the same day. I used AP flour for both recipes for two reasons: (1) to see for myself what AP flour does to bread, and (2) to simplify the experiment. After having used strictly bread flour for so long, it was enlightening to see the effects of AP flour. The dough was much looser and easier to work with. Shaping was much easier. Interestingly, Julia's recipe yields more airy bread. Reinhart's rises more in the oven (creating very circular loaves), but Julia's swells much more during proofing. And, Julia recommends intentionally popping bubbles during the shaping phase, so it's not that Julia's dough retained more bubbles from the rises. Though, it is worth noting that Julia's dough rises better. Her descriptions of the dough tripling in size during the first rise are accurate. Reinhart's proofed dough was easy to slash (maybe because it didn't swell so much? ), where as Julia's was difficult---I couldn't make deep cuts. 12/23/05 I'm branching out. 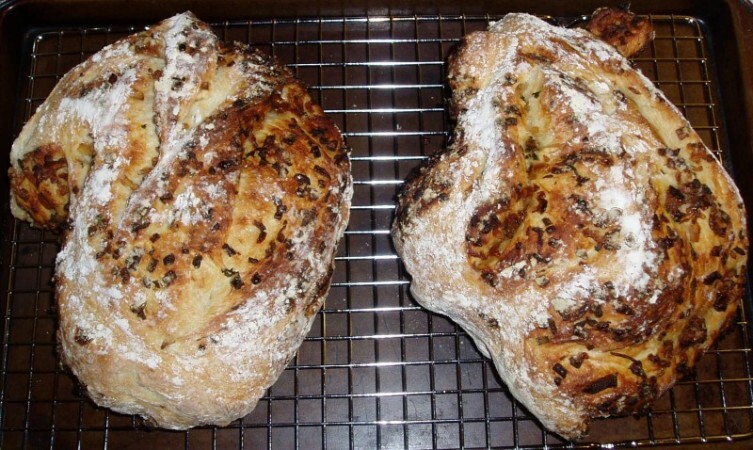 Today, I made herb and carmelized onion ciabatta for Helen as a Christmas present. I mostly followed Reinhart's recipe; the carmelized onion and herb ciabatta is an alternate version of his ciabatta. 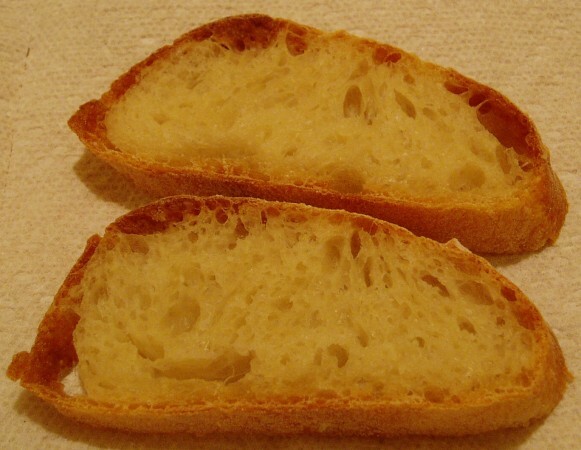 I made up my own ciabatta recipe, using proportions based on my french bread recipe. 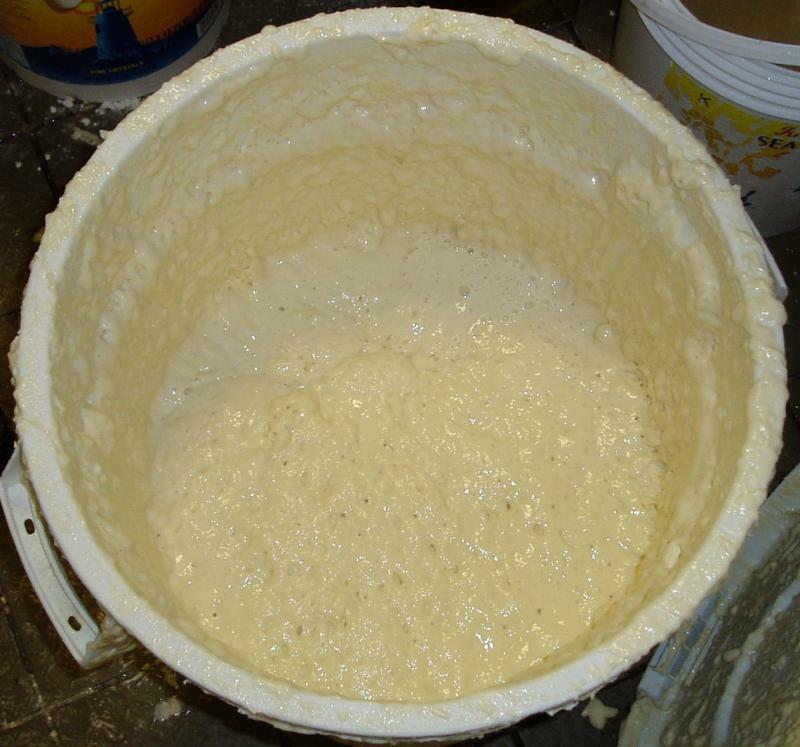 It starts with a poolish, a super-wet dough (1:1 water-to-flour ratio), that is fermented overnight in the fridge. This is later combined with a dry-er mixture to create a more reasonable water-to-flour ratio (around 0.75:1). 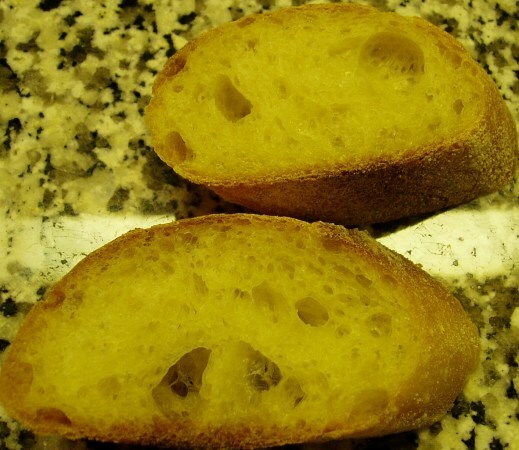 The main difference between ciabatta and french bread (as I understand it) is the shaping. 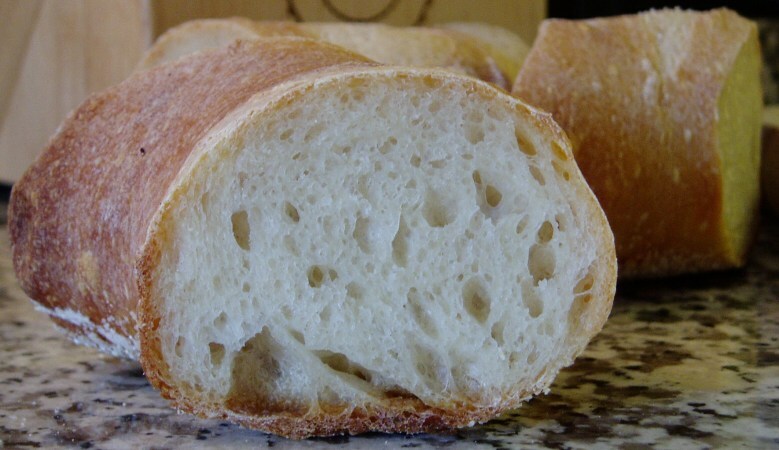 Ciabatta uses a fairly simple shaping proceedure---the dough is folded on itself multiple times and fermented on a flat surface (rather than in a bowl). Reinhard recommends bread flour for the entire recipe. 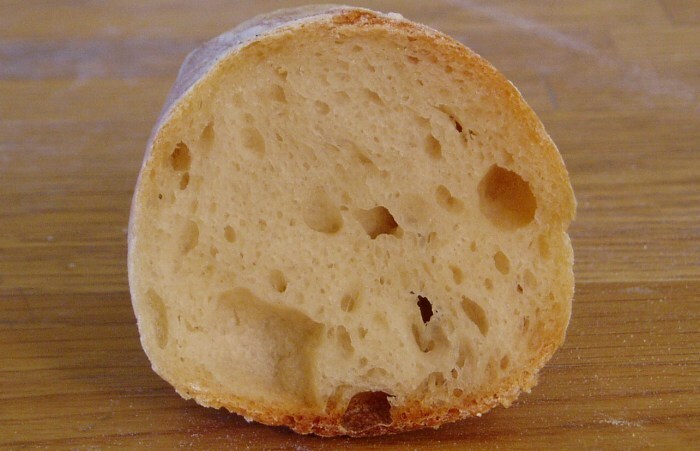 As I now know, bread flour gives great chewiness and spectactular structure (holes) in the crumb, but is very resillient and is not easy to shape. I roughly knew this before. I knew that bread flour had higher gluten, and gluten is what you might call the glue or internal bonding agent of dough. But, it wasn't until this weekend that I could see the difference clearly. Anyway, bread flour works great for ciabatta because the shaping is relatively simple---and you get that great chewey crumb. The onion and herb experiment seemed like a disaster. Reinhart tells you to incorporate the mixture fairly early; I waited until right before proofing. I added the mixture as I was folding. I succeeded in doing two add-and-fold steps (as Reinhart tells you to). But, after that I still had onion and herbs left, so I tried to do another add-and-fold step. Oops. The dough at that point was very hard to control---it just didn't want to do another fold. And, the wetness in the onion and herb mixture made it impossible to get the dough to stick to itself. I.e. two folds was all I was going to get. At that point, the dough was just a single loaf, so I cut it in two and threw the doughs on the canvas for proofing. I didn't attempt to shape any further---the dough wasn't going to listen to me any more at that point. It looked like a total mess---carmelized onions were oozing out the sides of the dough. It stained my canvas. I though there was no hope, but I trudged on. After proofing, I slid the loaves in the oven and hoped for the best. Magic happened in the oven. What came out looked gorgeous and tasted even better. Helen was ecstatic and is now demanding that she can give requests for me to bake a special bread for each holiday. :) No way I can describe what the loaves look like, so I'll let the pictures do the talking. The inside of the bread was very tender---not chewy at all. I think it's due to a lack of kneading (not due to AP flour, as I originally thought). 12/18/05 I am currently eating bread that I baked over 4 weeks ago. How is that possible? Simple: the freezer. I wrapped the loaf in plastic wrap and stuck it in the freezer. Today, we took it out about an hour before dinner, stuck it in the oven at 400F (preheated) about 10 minutes before dinner, and enjoyed very good bread (not as good as freshly baked, but much better than most breads you can buy at the store. Even better is if you can take the bread out 2 hours before eating. Then it will have time to come to room temp without added heat, which is the best way to defrost. 11/19/05 Used Julia's recipe again. First rise went slowly (6 hours), but temperatures in the house were about 65F. Second rise was normal (1 3/4 hours); room temperature was quite a bit warmer, about 75F. I proofed for about 1 3/4 hour, again in a warm environment (75F). I didn't slash, but the loaves still deflated when I put them in the oven. 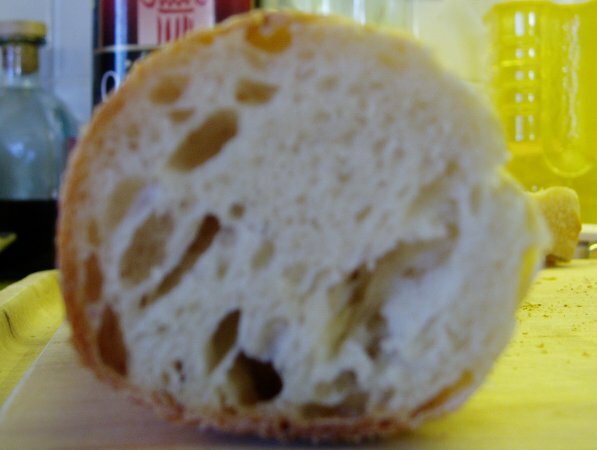 But, the end result was fully-inflated loaves---round from a side-view---clear improvement over slashing. One thing I realized is that I should put the initial 3 ice cubes in the oven about a minute before sliding in the loaves. This will give the ice a chance to create humid oven environment. I baked for 30-33 minutes. Wow. I think I've done it. I've achieved the unachievable. 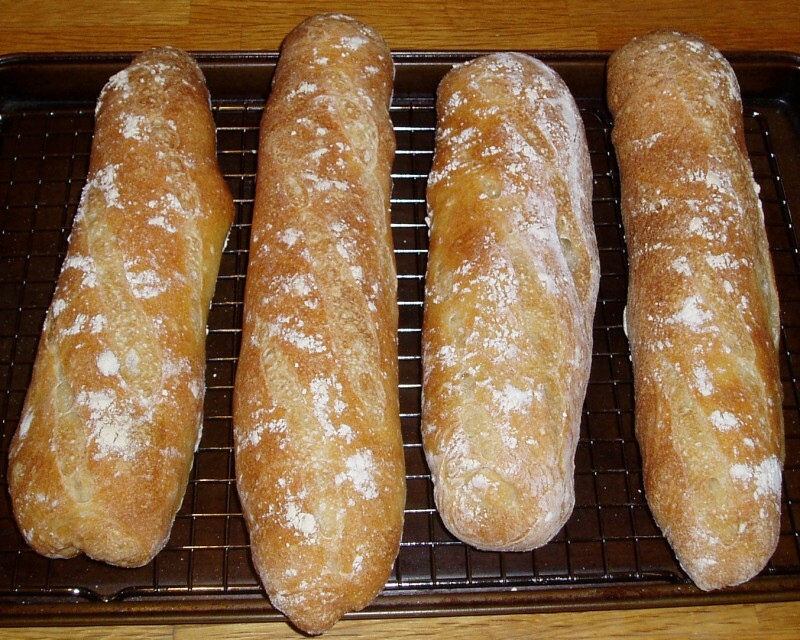 I have mastered French bread, at least as far as the gustatory experience is concerned. 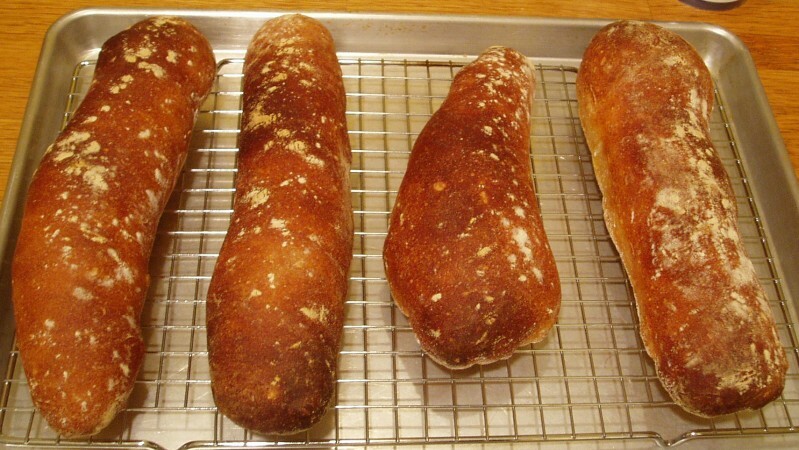 My loaves don't have the visual appeal that your usual French baguettes have, but their taste is superb. The crust is thin, crunchy and brittle; the crumb is hole-y, chew-y and flavorful. I'm not sure if I've ever had French-style bread this good. Well, I think they could do with just a touch more salt. I'm going to up the recipe to 4 t. Kosher salt. 11/5/05 Old School. Went back to Julia's recipe, though I incorporated a lot of tips from my pre-ferment recipe. I was surprised how smoothly it went. Risings took exactly as long as she said they would. I used my proportions---I still think she uses waaaaay too little water. Followed her forming steps, though I cut into four pieces instead of three. I baked at 450F, but for longer than she suggests---29 minutes for the outer loaves, 32 minutes for the inner loaves. She is very right when she says that the bread needs to cool 2-3 hours. It's too moist in the middle if you eat it sooner than that. I slashed the loaves, but didn't like the result---they instantly deflated and didn't fully re-flate in the oven. Julia says that slashing is for decoration; I'm guessing that it serves no other purpose. One problem with doing 4 loaves is that they just barely fit my cookie sheet. Two of the loaves actually joined in the oven---I had to cut them apart. But, I'm amazed that her 35-year-old recipe (originally published 1970) is as good as it is. The true test will come tomorrow, but I have a sense that her basic instructions are better than Reinhart's. 10/29/05 Very wet dough, as usual. I did step 2 as a regular rise (no refidgeration). Dough was warm to the touch after the step 2 rise. For step 3, I didn't chop the pre-ferment into small pieces, just kneaded the two doughs together. Seemed to work fine. My rise times were 1.5, 2, 3, 2 hours (steps 1, 2, 3, 4 respectively). From L to R in the picture, I baked 26, 28, 29, 30 minutes. First two were the "outside" batards. Much darker crust than I usually do. Crust darkened more quickly than usual. I decided to not slash before baking. Took some cool pictures with natural light shining through the bread the day after baking (far right). 10/15/05 Dough felt very wet, took a lot of extra flour to keep it sticking to my hands. Cooler than last time (mid 60s). New, long step 3 & 4 risings. Flavor wasn't as good as last time (maybe need even longer risings when ambient temp is lower?). Good holes. Don't think I baked long enough, though. Crust was dark brown, but fairly thin---didn't get nice crispy skin like last time. Skipped the baguette shaping step---ended up with shorter, wider loaves; they were similar in shape to Dominic's ciabatta loaves. I really liked the shape. Just need to bake a bit longer. I did 25-26 mins for the outer loaves, 28 mins for inner loaves. I think it needs to be more like 27/30. One mistake I made was to proof the loaves seam-side up. This caused the dough to stick to my bread board. However, it's not easy to keep the dough from sticking. It's important to make sure that all sticky surfaces of the dough are turned inward once shaping is finished. The sticky surface is so large after rising that it's difficult to fully turn it inward. Need to work on this. 10/08/05 Dough felt very wet, took a lot of extra flour to keep it sticking to my hands. Very high humidity and relatively warm temperatures (70s). Let dough rise extra long---3.5 hrs in step 3, 1.5 hrs in step 4. Excellent rising. Dough filled a 12 cup bowl in step 3, at least doubled in size for proofing. I forgot to slash the baguettes before putting them in the oven! Doh!!!! Bread came out extremely well, considering the blunder. Baked longer than usual, 26 mins for one baguette, 28 mins for the rest. Also, turned up temp at end (after 20 mins) to 500F. Crust turned out great---crunchy on outside, chewy on inside; I should integrate this into my recipe. Used bread flour for step 4. I think regular flour is better than rice flour for this step. 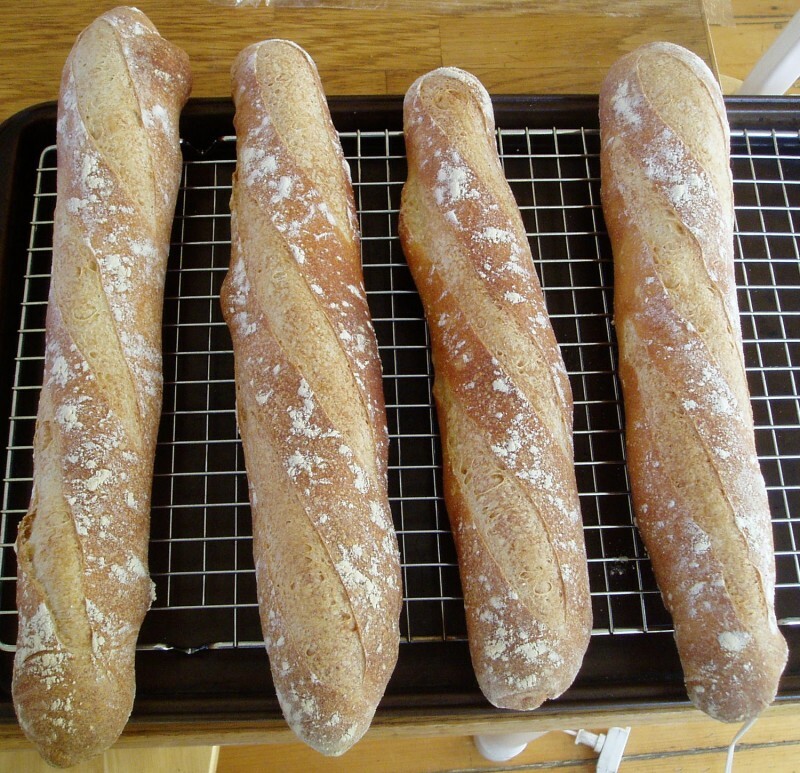 In step 4, I did not leave enough room between the baguettes. There was very little room for me to insert the bread board. Need to make sure to space out baguettes on the canvas (part of the problem was the fact that the dough rose so much during proofing! 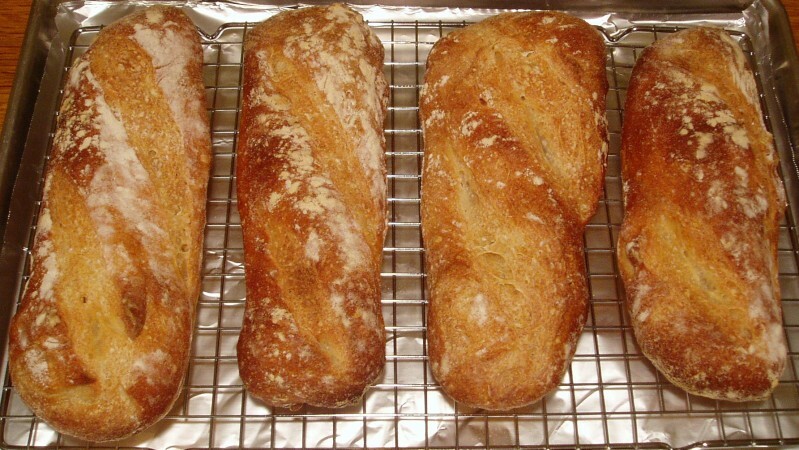 :) The shaping that I use, batard, then baguette I think may make the dough too long & thin. I should try just doing the batard shaping and not proceeding further. Really excellent internal texture, I think due to the excellent fermentation/risings. Helen thought it was the best texture yet. 10/02/05 Used new instant yeast. Noticed better rising. Outside baguettes done @ 22 mins, inner baguettes done @ 25. Great flavor. Pretty nice holes. Thinking it'd be even better if I let it proof for longer, say 2 hours instead of 1. Would also be good to try higher-temperature baking. 9/25/05 I should add a little more salt (e.g. 1/4 t. to second mix). I did a good bit of kneading both times. 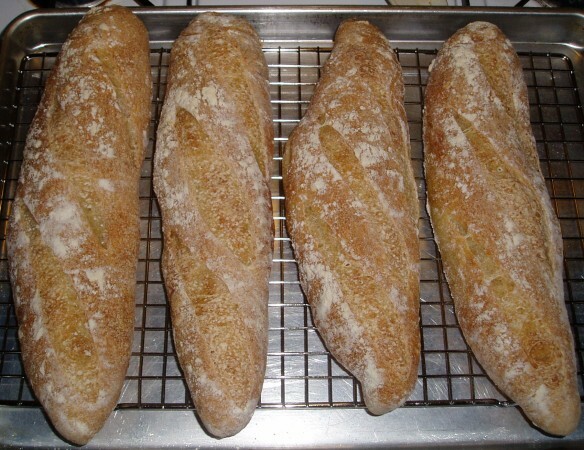 I rotated outer baguettes @ 15 minutes; they were done @ 20 mins; inner baguettes were done @ 22.5 mins. Dough did not rise much; probably a combination of old yeast and cool temperatures (about 65F). I let the dough rise extra long (about +50%). I think I ought to get new instant yeast. 11/14/04 Tried two batches---one of four and one of two. Shaping the batch of two felt good, but it was hard to keep the shape from getting too long. Need some more practice on shaping larger baguettes. Took longer than I thought to cook. I left some baguettes cook for up to 29 minutes(!) 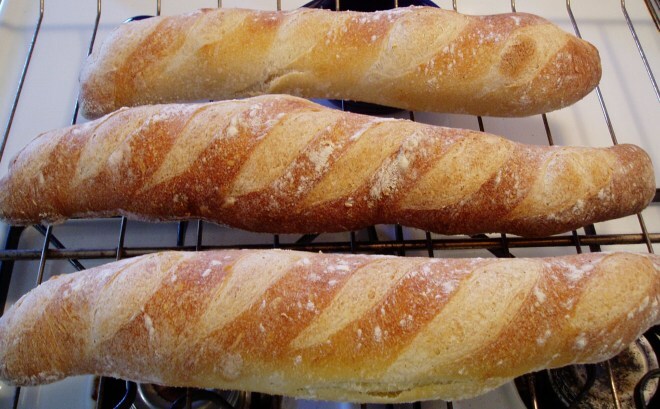 Need to update recipe: outside baguettes should be rotated at 20 minutes, outside and smaller baguettes done at 25 minutes, middle baguettes done at 30 minutes. I checked the internal temperature: 210F. 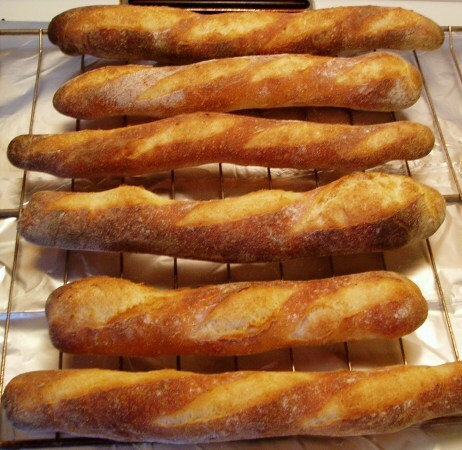 Small baguettes: excellent crumb and flavor. Wow! Impressive. 10/23/04 Used the 8 oz. BF pre-ferment recipe. For the second mixing, I first integrated the ingredients to the point that I could knead, then I added the pre-ferment pieces. This seems to have allowed the pre-ferment pieces to integrate well. Found mold on my cloth; it's clearly due to the fact that I stored it in a plastic bag. Bad idea! Used 3 ice cubes at start, then one a minute for three minutes; extra steam seems to have helped with in-oven rising. Dough gave off excelent sweet smell after rising and during kneeding. Did a significant amount of kneading---more than September tries. 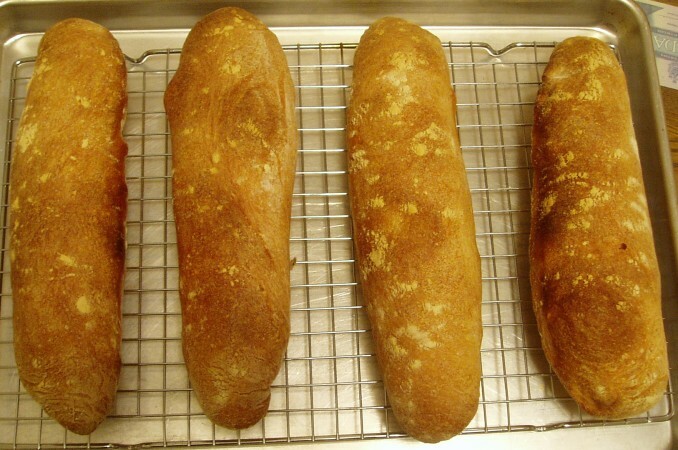 Sides of baguettes came out underdone. I think I should really do 450F as a baking temperature in the future. One baguette looked done at 19 minutes. I turned the temp down to 450F and left the other three in for a few minutes longer. 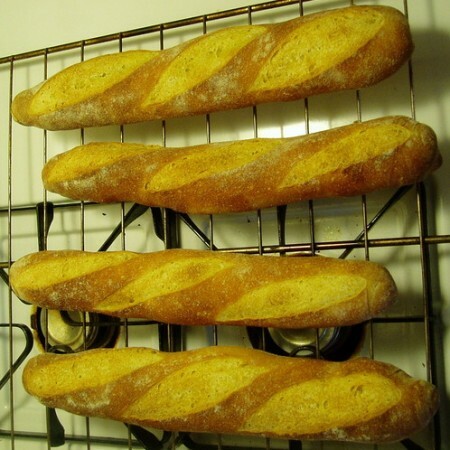 Also, I turned around the outside baguettes to try to even out the baking. 9/10/04 Used 6 oz. BF, 3/4 c. water sponge. Let rise for 2 hours. Added 6 oz. BF, 1/4 c. water, 2 t. kosher salt, 3/4 t. instant yeast. Knead. Let rise for 2 hours. Fold. Let rise for 40 minutes, then 20 minutes in fridge. Cut into thirds using scale (6 2/3 oz. each). Shape to batard. Rest. 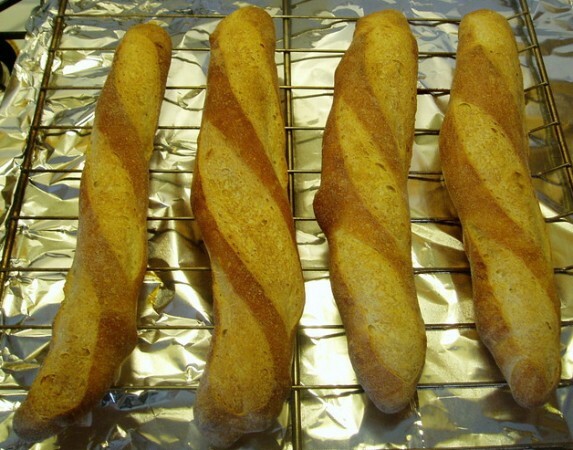 Shape to baguette. Didn't roll out as thin. Proof on canvas. Oven at 500F for 18 minutes. Two ice cubes to begin, another two after 90 seconds. A little burnt on bottom. Maybe 450F would be better cooking temp. Externally, best looking bread so far---perfectly straight, excellent slashes, golden brown color. 9/04/04 Tried two different recipes: 6 oz. flour, 1/2 t. salt, 1/3 t. yeast, 2/3 c. water as a pre-ferment, and 6 oz. flour, 1/3 t. yeast, 3/4 c. water as a sponge. Doubled pre-ferment proportions. Added 1 t. salt, 1/2 c. water to sponge. Sponge recipe didn't rise much in oven, but came out better. Both doughs were too wet. Need to cut down on water a bit. Also, used SdLT tools for transfering, slashing & sliding into oven. Very nice shape & look. No more "S" breads. Next: try sponge of 6 oz. flour, 3/4 c. water; add 6 oz. flour, 1 t. salt, 2/3 t. yeast, 1/4 c. water. 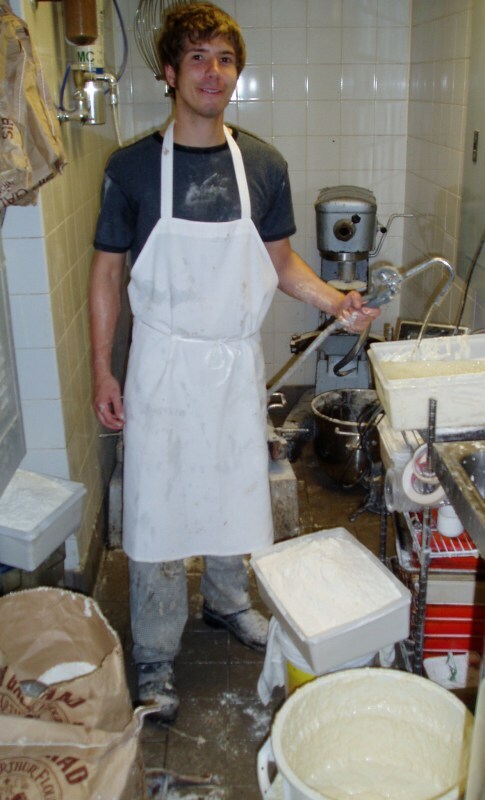 8/28/04 I can't imagine a better birthday present than getting to spend a day in one of the best bread bakeries in Boston. My wife gave me exactly that. She arranged for me to spend the day with Michael Rhoads, the master baker at Sel de la Terre. 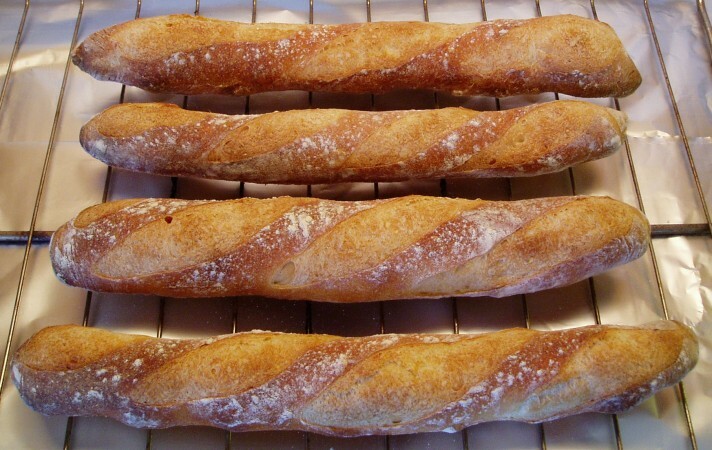 If you've never had their baguette, you're missing out! I spent the morning with Mike, learning about shaping, proofing and slashing baguette, and how to properly transfer to peel and into the oven. So much I didn't know! 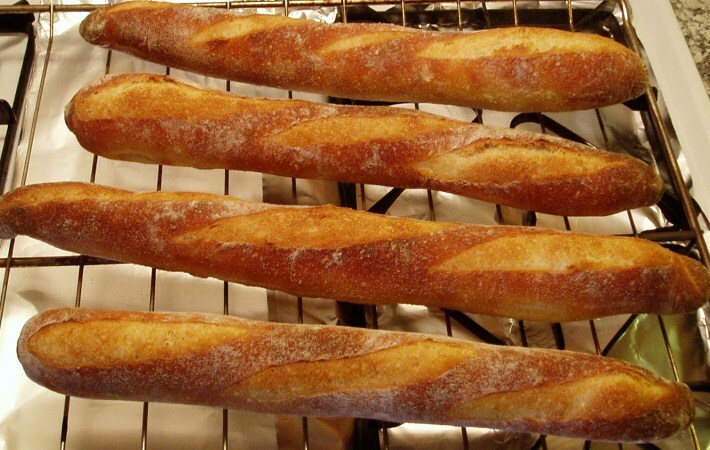 A razor blade is the only way to slash baguette! I'll never use a knife ever again. I also now know why they use canvas for proofing. It's not so much for shape as it is ease of transfer to the peel: place a board next to the dough, raise the canvas to roll the dough onto the board, then roll onto the peel. One thing to remember: proof and bake seam-side down. Only time the bread should be seam-side up is on the board. Mike showed me how they shape baguette: such technique! When I tried later in the day, I started to get the hang of it. Oh, and I got to mix lots of pre-ferments. For the white doughs, they use about a 1:1 flour water ratio for the pre-ferments and mix them in 15(?) gallon buckets. You just dive in with your hand and mix away. Felt like I was a kid again. :-) Oh, and my favorite part was sliding the proofed dough into the oven. Four baguettes go on a peel. You slowly ease the peel into the oven. Then, when you're 3/4 of the way in, you push-and-yank. The dough slides perfectly onto the hot oven surface. 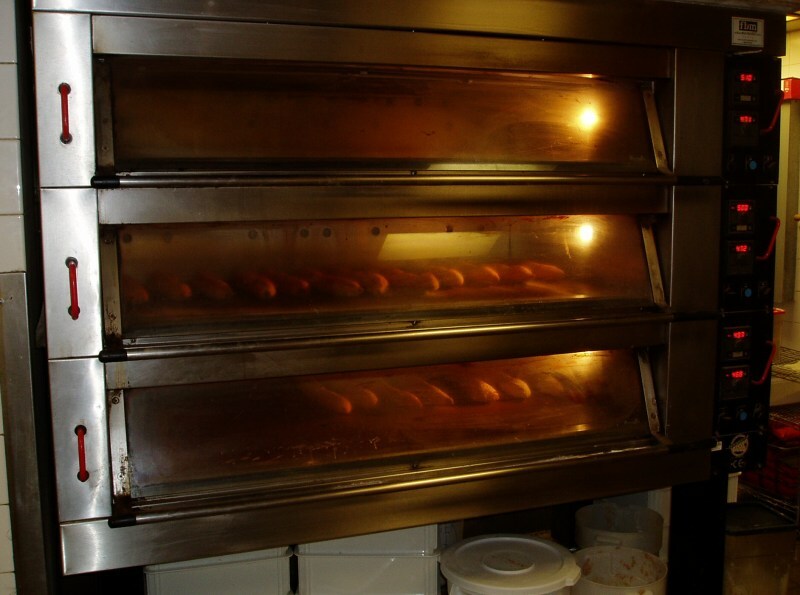 Oh, and what ovens! No ice cubes, baby! Just press a button and the oven fills with steam. There's even a lever to pull to vent the oven and let the steam out. Good news for home bakers like me: they use a 500F cooking temperature for about 19 minutes. Of course, they eye-ball instead of timing. Helen visited me for a lunch in the SdlT dining room. I had a great steak frites and Helen had perfectly cooked eggs sunny-side-up (not overcooked like most places do them). After lunch it was back to the kitchen. I spent spent some time with Dave, the master mixer. He introduced me to his two mixers: the big one and the baby. Though, the baby handles 5-10 times as much dough as my home Kitchen Aid! The big one handles twice as much dough. The dough hook is two feet tall! Anyway, they measure everything by weight as I've heard from reading books. Also, everything is in kilos. Mike says its easier than dealing with fractions and whatnot. I agree. Their scale is a serious scale: measures down to the gram, though not always perfectly reliably :) Dave had me (try) to take dough out of the mixing bowls. OMG! 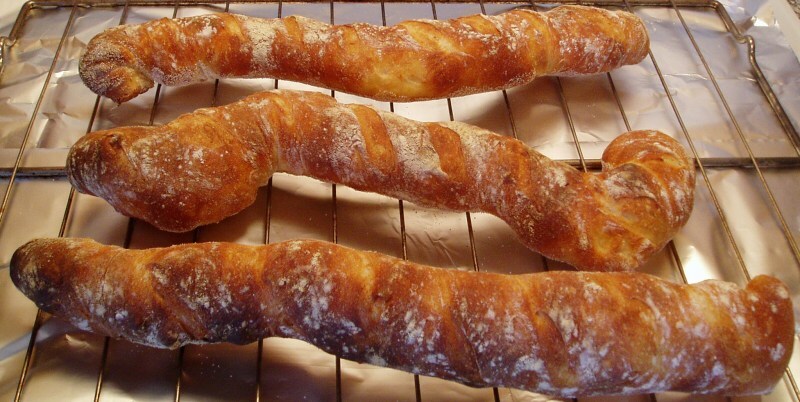 The dough sticks like glue and does not want to break apart. Dave can somehow get his arms completely under and pull out an entire batch (25+ lbs.) at once! The dough goes into 4' by 2' bins for rising. They stack. By the end of mixing, we had a stack ten bins high! That's something like 250 pounds of dough! Did I mention they go though 300 pounds of flour each day? After getting to know the mixtures, I got to work with Rachael. We did cutting and shaping. She's so fast it's amazing. 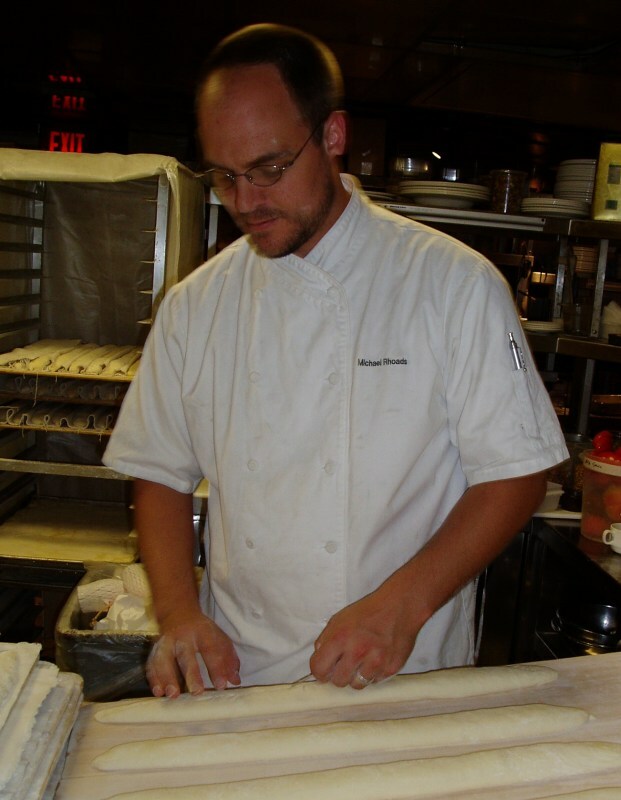 Dough has to be segmented into pieces, anywhere from 8-24 ounces depending on the bread. She cuts an initial piece that's usually within 10% of the desired weight then adds or removes a small piece to get it to the right weight. 5-10 seconds max for each chunk of dough? Me? Took me at least 30 seconds for each chunk! Guess it takes a while to eyeball 20.5 ounces of dough. For their round loaf breads, they use mainly plastic baskets, with a light covering of rice flour to make sure the dough doesn't stick. Wicker is too much trouble for the volume they do: it accumulates bacteria and can't be thrown in the diswhasher. Rachael said they will only last 2-4 weeks before they'd have to be thrown out! Rachael tried to show me how to shape boules. It's amazing to watch. 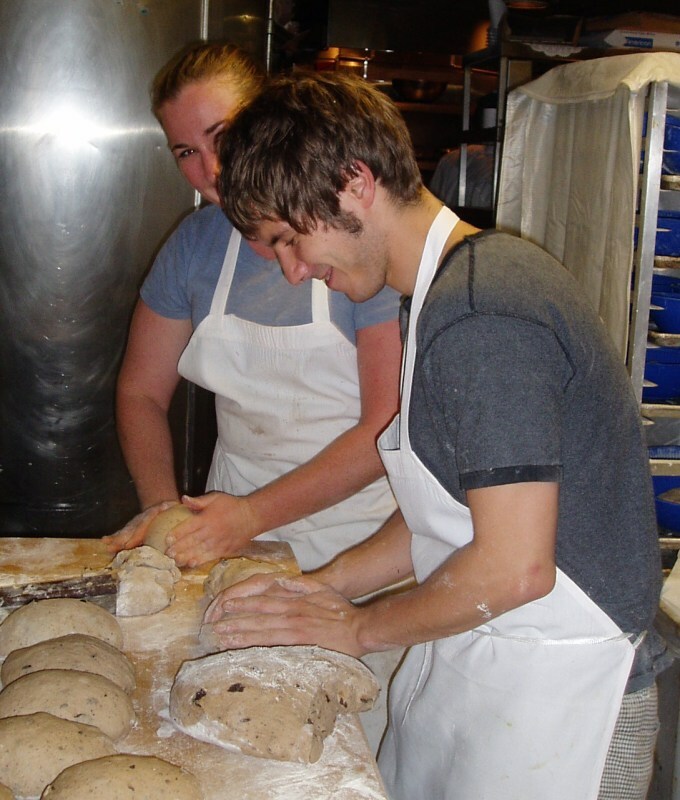 Her hands circle rapidly around the dough, applying pressure with alternate hands. In 10 seconds, it's a perfect ball with excellent surface tension. After watching her enough times, I could sort of do it on the wetter doughs, but the dryer ones like rye baffled me! No trouble for Rachael! The boules go in baskets, on trays, seam-side up. They have nice proofing racks with tent-like covers to keep the moisture in. 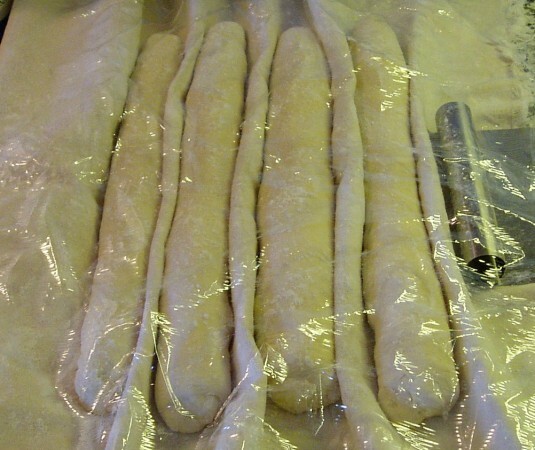 Before it was time for me to go, Rachael and I shaped a special batch of baguette dough. 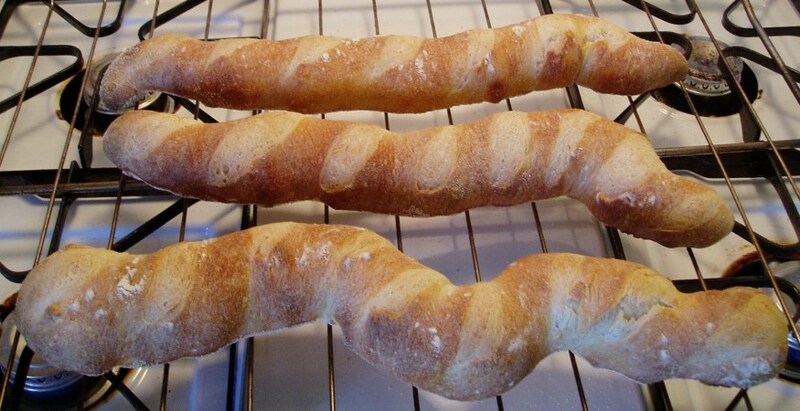 Only with her help was I able to approach the signature SdlT baguette shape. I transfered, slashed and put them in the oven. After they were done. I said my good-byes. Dave and Rachael were great to work with and Mike was extremely gracious to let me invade his kitchen :-) Besides giving me two baguettes to take home, they also gave me some going away presents: my very own couche, board and razor blades. All the things I was missing! Can't wait to bake bread again!!! So much new knowledge to apply! Pictures (L to R): (1) Mike transfering dough to a peel, (2) the ovens, (3) lunch with Helen, (4) Dave and his mixers, (5) the sourdough culture, (6) Dave and Rachael shaping boules. 8/26/04 Baked 500F for 20 minutes, used five ice cubes. Bread came out golden brown, burnt in some spots, yellow in others, but overall excellent exterior done-ness. Crumb was chewy w/ lots of holes, though I wonder if it would have benefited from some more kneading; crumb felt a little too fluffy. It also felt a touch dough-y. Maybe baking at 450F would be better. Bread had wonderful smell and flavor. Dough did not seem happy during shaping: there were two "lumps" in the dough and it didn't rise much during proofing. I think the lump problem was caused by mixing the dough pieces with water; dough pieces should be mixed with dry ingredients, then water added. To reduce recipe, try 6 oz. flour, 1/2 t. salt, 1/3 t. yeast, 2/3 c. water. 8/19/04 Used new, high-water recipe. Dough was very wet (as expected). I did minimal kneading. Only innovation was ice: I threw four ice cubes on the bottom of the oven. Bread rose very quickly initially. I think ice cubes provide more steam than the sprayer I have used before. Bread tasted wonderful and had great texture. Very airy, getting close to Clear Flour airiness. I started the oven at 500F, turned it down to 450F after adding the ice cubes, then (rembmering the new recipe), turned it back up to 500F with 7 minutes to go. Two loaves were done at 22 minutes, one needed 2 extra minutes of cooking. 6/27/04 Used 8 oz. bread flour (no AP flour), 7/8 c. water in both mixings. I also hand-mixed the dough like Julia describes; would have been hard to scrape out of the bowl had I done it via Kitchen Aid. Dough was much more airy than usual, good holes in finished product. Big improvement over previous tries. Accidentally left oven temp at 500F, took bread out after 19 minutes noticing that crust looked burnt. Crust tasted great---crispy, but not burnt tasting; inside was a bit dough-y. Crust was golden brown, burnt in spots. 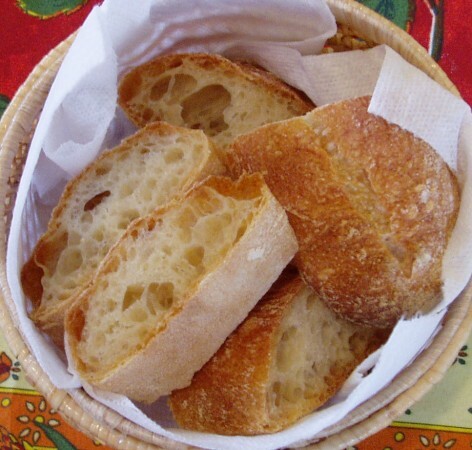 Somewhat like "Sel de la Terre" bread. 4/25/04 Used 1 c. water in second mixing; dough was hard to get out of bowl, but great otherwise; retained an internal sticky-ness through final shaping. Kneeded only 5 minutes for 2nd kneeding. Used 2 t. kosher salt for second mix---much better flavor than last time. Overall, very good outcome. Good taste, good texture (though center was a little dough-y in some parts). Need to try using less flour---maybe 9 oz per mix (w/ 7/8 c. water). I always end up with too much dough and have to scrunch the baguettes to make them fit on the baking stone. Baguettes were thinner than usual (2 in. dia.) (guess I shouldn't have rolled them much during shaping). 2/8/04 Needed more water than usual, almost 1 cup per mix; maybe due to less humid winter air? Made dough sticky after 2nd mix---stuck to bowl and table; was fine after some kneading. Dough seemed to do little during rises and proofing, but opened up very nicely in oven---probably one of my best breads. I am beginning to think that the size of holes has more to do with the flour-to-water ratio that how much the bread rises before baking. I kept two loaves in the oven for an extra minute---the crust didn't look finished. I think I should have kept them for a bit longer. The small loaf had great texture; the other two were a bit dough-y. I used kosher salt this time (2 t. kosher = 1 t. table), 1.5 t. for the first mix, 1 t. for the second (less, thinking that it was inhibiting rising). Bread came out bland. Guess I should have used the standard formula.